Synopsis : Sikander Bansi, an unlikely political heir in Delhi, secretly records politicians in Parliament as they haggle to become cabinet ministers, bag defence contacts, dodge criminal charges and collect corporate largesse. Among them is a rising leader of the People’s Party, Nalan Malik, whose success has come through unscrupulous means. When Sikander suddenly disappears, Mira Mouli, a newspaper journalist with an unusual gift for knowing people’s thoughts, receives the controversial Parliament tapes along with clues to find him. She is attracted to Sikander’s principles and is wary of Nalan’s deceit. But her powers of knowing tell her a different story, one that she can unravel only at the cost of her life. From the bestselling author of Shoes of the dead, this is a disturbing political fiction that reveals why Parliament functions behind gates closed to the public. My view : I am not someone who is acquainted with political jargon or the various aspects of democratic government’s way of working. I am not entirely proud of it and strive to increase my limited knowledge on the subject of politics and ministerial on goings. I had my own share of hesitation while requesting the copy of this book for review because I didn’t know if I will be able to grasp the many intricacies of how the country is governed. 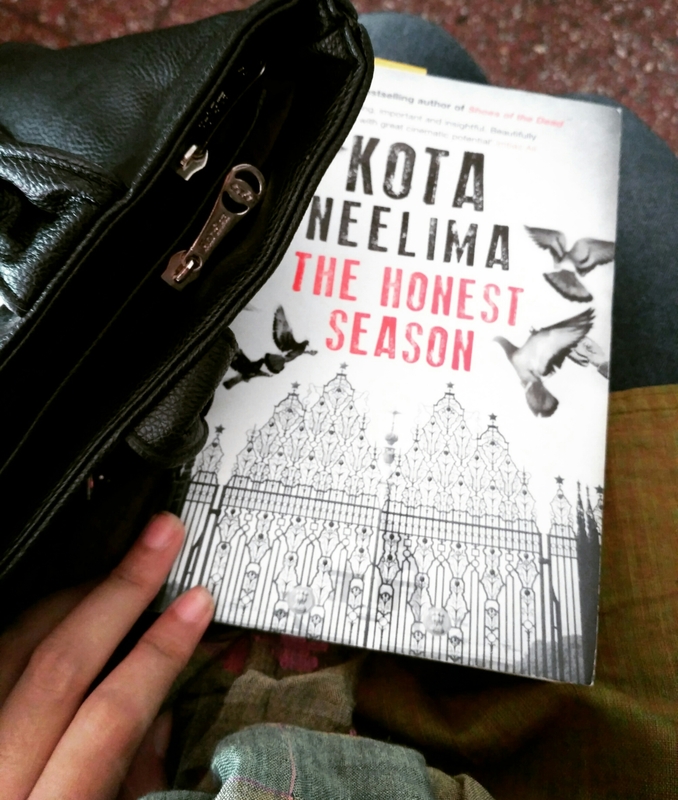 However, Kota Neelima’s book The Honest Season was simple and easy to follow and conveniently managed to enlighten me about the subject that many other citizens like me fail to comprehend due to lack of information. Being a political fiction, it has brilliantly mingled the stark reality of the political scenario with an upstanding fictional piece. The book brings to surface the mysterious dealings of public issues behind the closed gates of the government. We, as the law abiding citizens of India, are mostly unaware of how the public money is used or why a certain decision has been favoured by a ruling party and striked out by the opposition. Those with power are entitled to it because of the unlimited secrecy that is created around it, as has been clearly demonstrated by this literary piece. But secrecy is not the only reason why the gates of power remain closed, the people outside those gates tend to overlook and forget any harm that does not cause any immediate effect on their well being. Mira Mouli, the headstrong and independent female protagonist of the story had a disturbed and broken childhood. In spite of her unusual powers, that she uses in her know-journalism, and her growing popularity, she is a lonely and forsaken individual who craves for death. This once again remind us that although have adopted many a progressive measure towards approaching gender equality, there still remains a huge gap to diminish and the brunt of patriarchy to be destroyed. The book started on a powerful tune, the prologue gave a glimpse of how the government officials creep their way towards corruption and in their path manage to litter the entire environment. The author manages to hold her experiences charm in writing almost throughout the whole book but somehow the ending gets a little slack. Although the romantic in me was gushed by the way it ended but the cynical side of me scrutinised if there was really any need for Mira Moulin to end up with one of the men in her life. The ending only made the story more cinematic and it drifted away from the idea that was supported throughout the book via Mira’s beliefs. Despite this slight deviation, I thoroughly enjoyed the book. The pace is catchy and in spite of not being a thriller this novel manages to hold you on the edge and you won’t feel like leaving it anytime soon. The decryption of Delhi as not just a city but as a living character is refreshing and breathtaking. The author’s power of observation does not come as a surprise as she had spent the last 20 years as a senior journalist and specialised in writing on political events. Therefore, the description of the newsroom meetings and general narration of the media structure is honest and informative. Does this book promise of a solution to all the dishonest, corrupt practices by the authoritative figures? No. But it brings forth the grey areas that reside every human being and in every organisation. The awareness to the situation is essential although there might not be any promise of a happy ending. Kota Neelima has been a journalist for over twenty years, covering politics in New Delhi, India. She is Senior Research Fellow, South Asia Studies at the Paul H. Nitze School of Advanced International Studies, John Hopkins University, Washington, DC. Her recent academic research in India on perception seeks to develop a structure based on rural and urban voter choices. Her previous books include the bestselling Shoes of the Dead and Death of a Moneylender, among others. Also a well-known painter, Neelima’s works as a part several collections in India and abroad, including the Museum of Sacred Art, Belgium.